Boehs Building Supply is one of NW Oklahoma’s leading Hardware and Lumber Supply stores serving Helena, Cherokee, Fairview, Enid, Alva and the surrounding areas. We are also NW Oklahoma’s premier providers of amazing quality hearths. Drop by for a hot cup of coffee, meet the Boehs family and discover our wide range of products. Want access to over 67,000 items in our warehouse? Click here! Working together so you can get the job done! 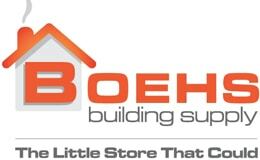 Boehs Building Supply wants to help you with all of your hearth, stove, fireplace, hardware and construction supply needs. The Boehs family have been involved in construction since 1956 – so we know our hardware! For more information on our products and services, please feel free to contact us today or visit us at one of our stores in Helena or Fairview. Not sure what you need? Get in touch or visit our stores.